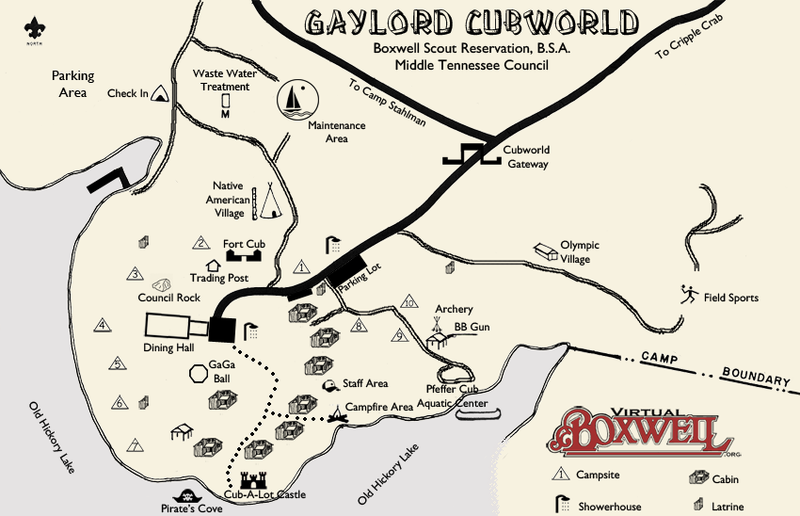 CubWorld originally began life as one of Boxwell's three original camps: Camp Murrey. 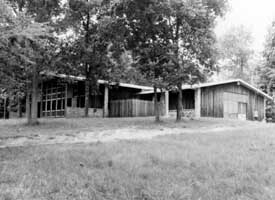 A camp designed for use by families in the summer, Camp Murrey's attendance had dropped steadily from the late 1970s. 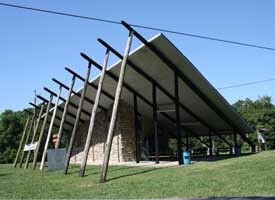 Therefore, part of the 1994 Capital Development Campaign was to dramatically overhaul and renovate Murrey into something similar, but totally new. 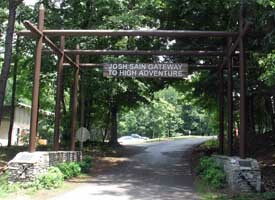 The decision was to build a camp dedicated to Cub Scouts. 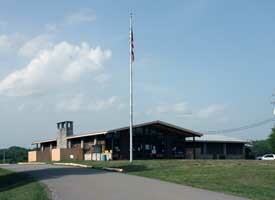 Gaylord Entertainment in Nashville contributed the lion's share of the money needed to build the camp and Gaylord CubWorld was born. 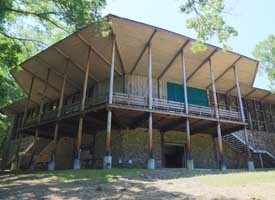 With a younger audience in mind, CubWorld has themed areas and more "playground" types of structures than the Boy Scout resident camps. 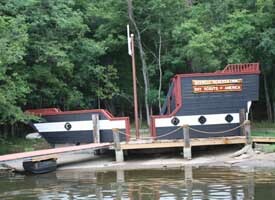 Thus, only at CubWorld will you find not one, but two pirate ships, a castle, a fort, and a Native American village! Presently below is fairly accurate map of the current arrangement of sites and locations at CubWorld. Just like the other maps, this map is based on the actual geography of Boxwell.. And again, just like the other camps, the site capacity numbers here are always in flux from year to year, so do not accept these numbers as hard and fast statistics! Hopefully, this map and the information with it, will give you a good idea of how CubWorld is arranged and what it has to offer visiting packs, dens, and Scouts!